I Skate, Therefore I Am: R.I.P. Baby Paul Cullen. Z-Boys Legend!!! Paul Cullen has been described as a "present and future terrorist," which pretty well sums it up. His skate activities constantly blow out the unprepared and the unaware. 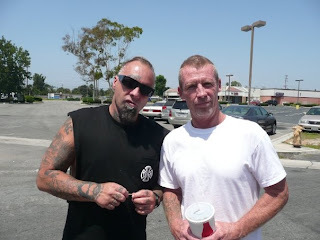 "Paul skates as well as anyone in Dogtown. "- T. Alva. In any given situation, Cullen comes through with one of the most radical, vanguard and spontaneous approaches around. You can never figure what he’s going to do next, ‘cause he never does anything the same. He is continually expanding his limits, and becoming more attuned. Paul emanates a poise and confidence that clearly shows his nine years of skating experience (a longtime association with many of the finest skaters around). Cullen’s past team affiliations read like a list of Who’s Who in contemporary skating: Zephyr, E-Z, Makaha, Logan and Z-Flex. He feels that "good equipment and hot riders" are what make up a quality team. 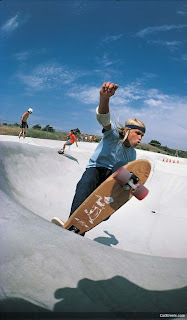 Paul credits Tony Alva with showing him "how to ride pools and banks," Stacy Peralta with "turning him onto freestyle," and Jay Adams with teaching him how to "just get radical." The young skater currently is riding the standard 27" Z-Flex, and the 30" Adams design, both with Bennett Pros and Road Rider 6 wheels. For maneuvers, he’s into "trying to get past vertical and pull it off," and being able to do anything frontside that he can do backside. 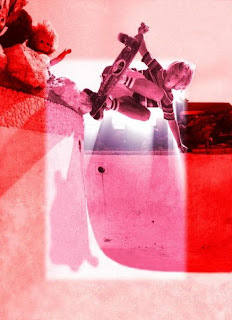 Pools, bowls and vertical banks are Paul’s favorite skating terrains, in general, with Keyhole, Manhole and Kenter "just for Sunday material," being his specific preferences. are "doing the best things." Cullen considers himself a professional, and he already has several notable film and commercial credits, including Pepsi Cola, Heinz Catsup, and Go For It. Paul thinks that there just might be some good opportunities ahead for him in skating, and he’s "just gonna wait and see what happens." There are few persons who would disagree with him; the only thing brighter than his present is his future. Maloof Money Cup. Part one The Vert sesh.